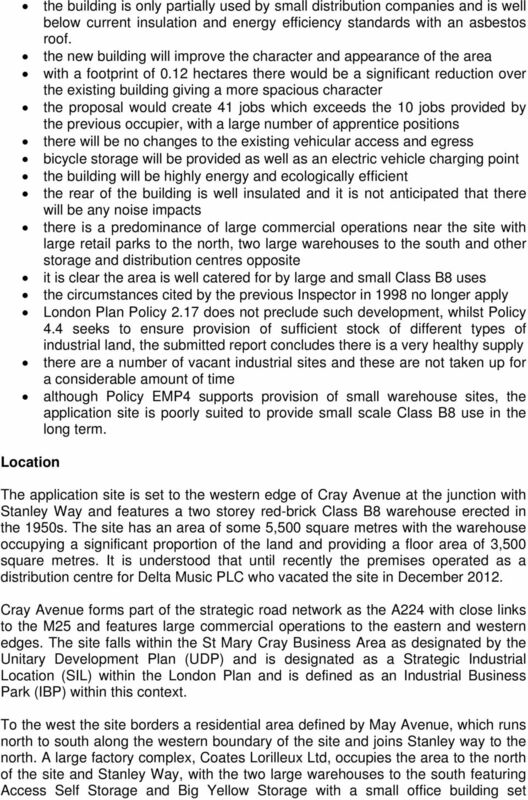 Download "Application No : 13/01609/FULL1 Ward: Cray Valley East. 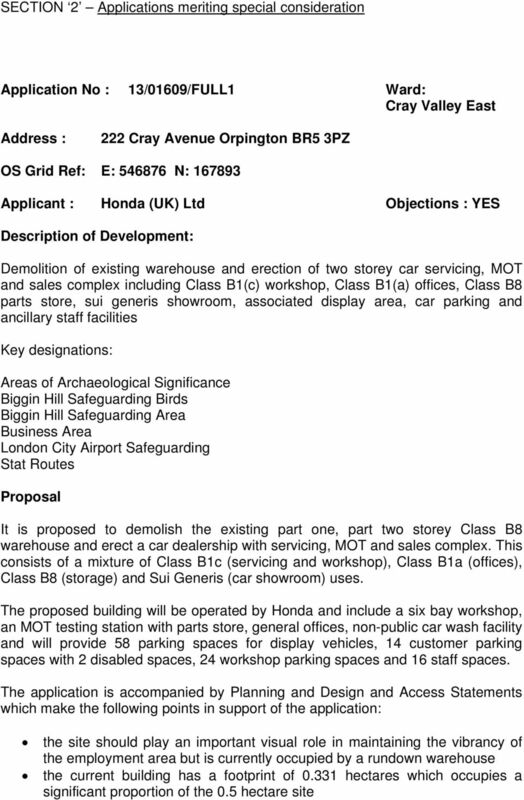 Applicant : Honda (UK) Ltd Objections : YES"
4 T18 Road Safety London Plan 2.17 Strategic Industrial Locations 4.4 Managing Industrial Land and Premises The National Planning Policy Framework (NPPF) is also of relevance. 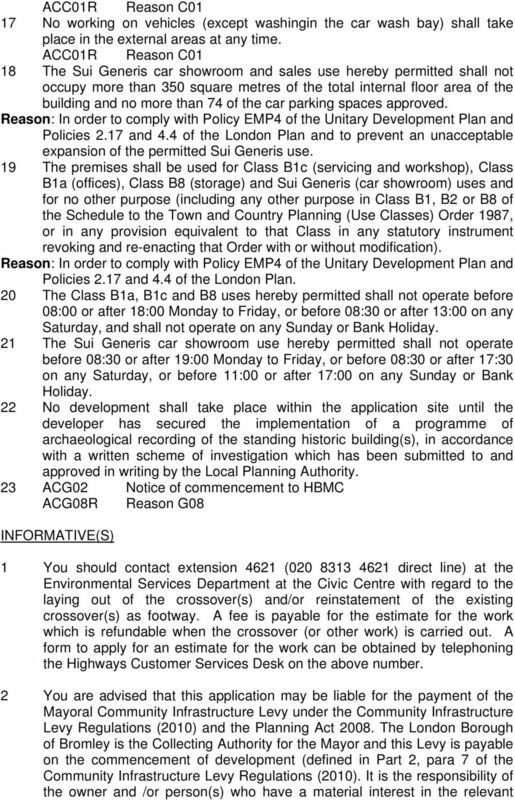 Planning History Application ref. 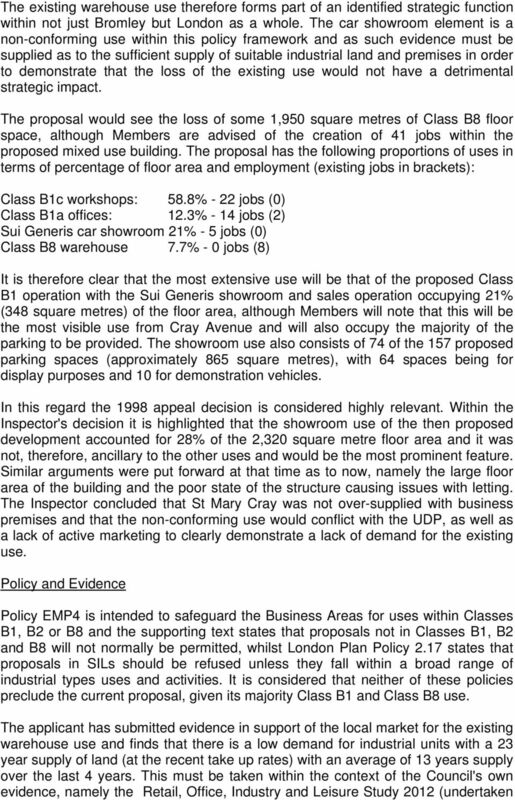 97/02816 refused permission for the demolition of the building and the erection of a vehicle repair workshop and ancillary showroom for retail car sales: "The proposal would result in the unacceptable loss of good quality warehousing and the introduction of a non-conforming use within this important business area, thereby contrary to Policies EMP6 and EMP4 of the Unitary Development Plan" This decision was subsequently upheld on appeal. 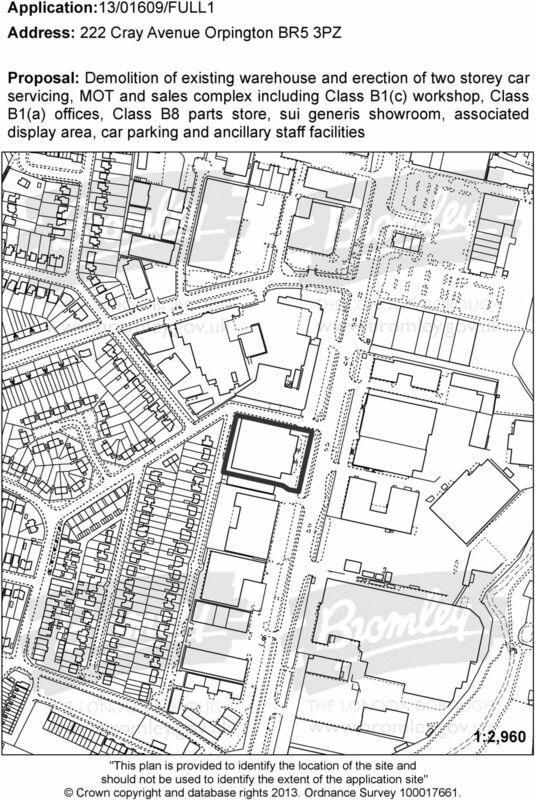 Within the Inspector's decision it is highlighted that the showroom use of the then proposed development accounted for 28% of the 2,320 square metre floor area and that there was no doubt that the car display area would be the front of the premises and the most prominent part of the development. 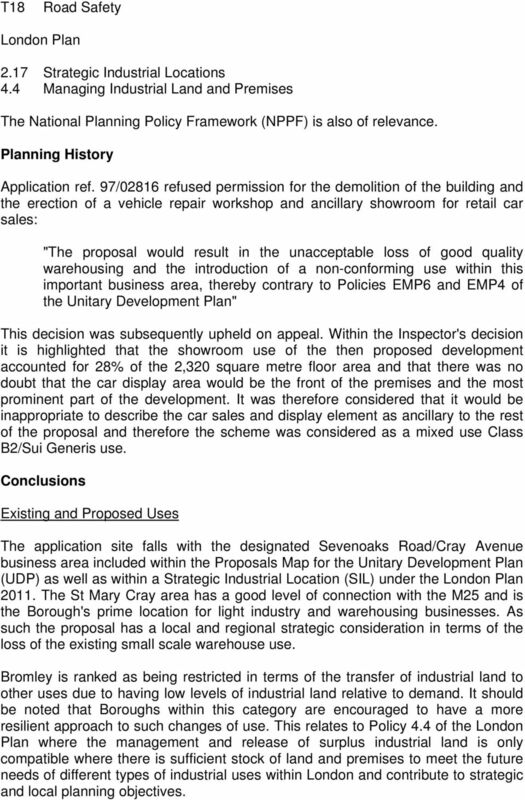 It was therefore considered that it would be inappropriate to describe the car sales and display element as ancillary to the rest of the proposal and therefore the scheme was considered as a mixed use Class B2/Sui Generis use. Conclusions Existing and Proposed Uses The application site falls with the designated Sevenoaks Road/Cray Avenue business area included within the Proposals Map for the Unitary Development Plan (UDP) as well as within a Strategic Industrial Location (SIL) under the London Plan The St Mary Cray area has a good level of connection with the M25 and is the Borough's prime location for light industry and warehousing businesses. As such the proposal has a local and regional strategic consideration in terms of the loss of the existing small scale warehouse use. Bromley is ranked as being restricted in terms of the transfer of industrial land to other uses due to having low levels of industrial land relative to demand. It should be noted that Boroughs within this category are encouraged to have a more resilient approach to such changes of use. This relates to Policy 4.4 of the London Plan where the management and release of surplus industrial land is only compatible where there is sufficient stock of land and premises to meet the future needs of different types of industrial uses within London and contribute to strategic and local planning objectives. 6 on the Council's behalf by DTZ) which finds that there is a falling requirement for industrial and other business uses due to a decline in the manufacturing sector and a decline in warehousing. There is also a small increase in non-b Class uses requiring traditional employment. The NPPF states that policies should avoid the long term protection of site allocated for employment use where there is no reasonable prospect of the site being used for that purpose and where there is no prospect of a site being used for the allocated employment use, applications for alternative uses should be treated on their merits having regard to market signals and the relative need for different land uses to support sustainable local communities. The applicant contends that the building, which has been vacant since December 2012, is in a poor state of repair and is in need of significant remedial works that would require significant expenditure. There is evidence of previous failed attempts at this work that suggests this being a long term issue and that the cost of rectifying these problems exceeds the unit's potential return. 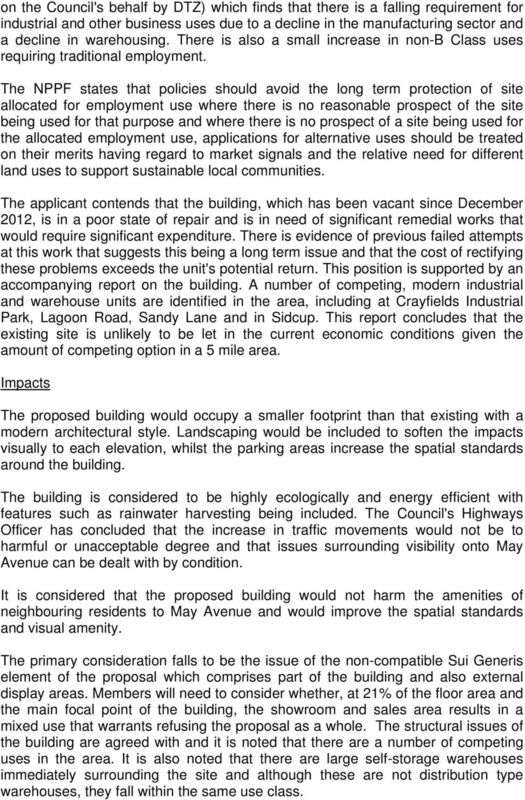 This position is supported by an accompanying report on the building. A number of competing, modern industrial and warehouse units are identified in the area, including at Crayfields Industrial Park, Lagoon Road, Sandy Lane and in Sidcup. 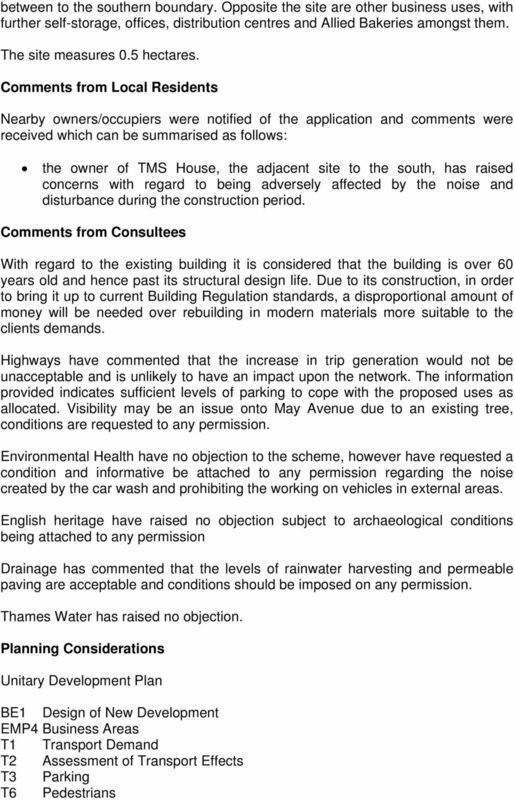 This report concludes that the existing site is unlikely to be let in the current economic conditions given the amount of competing option in a 5 mile area. Impacts The proposed building would occupy a smaller footprint than that existing with a modern architectural style. Landscaping would be included to soften the impacts visually to each elevation, whilst the parking areas increase the spatial standards around the building. The building is considered to be highly ecologically and energy efficient with features such as rainwater harvesting being included. The Council's Highways Officer has concluded that the increase in traffic movements would not be to harmful or unacceptable degree and that issues surrounding visibility onto May Avenue can be dealt with by condition. It is considered that the proposed building would not harm the amenities of neighbouring residents to May Avenue and would improve the spatial standards and visual amenity. The primary consideration falls to be the issue of the non-compatible Sui Generis element of the proposal which comprises part of the building and also external display areas. Members will need to consider whether, at 21% of the floor area and the main focal point of the building, the showroom and sales area results in a mixed use that warrants refusing the proposal as a whole. The structural issues of the building are agreed with and it is noted that there are a number of competing uses in the area. It is also noted that there are large self-storage warehouses immediately surrounding the site and although these are not distribution type warehouses, they fall within the same use class. 9 land to pay the Levy (defined under Part 2, para 4(2) of the Community Infrastructure Levy Regulations (2010). If you fail to follow the payment procedure, the collecting authority may impose surcharges on this liability, take enforcement action, serve a stop notice to prohibit further development on the site and/or take action to recover the debt. 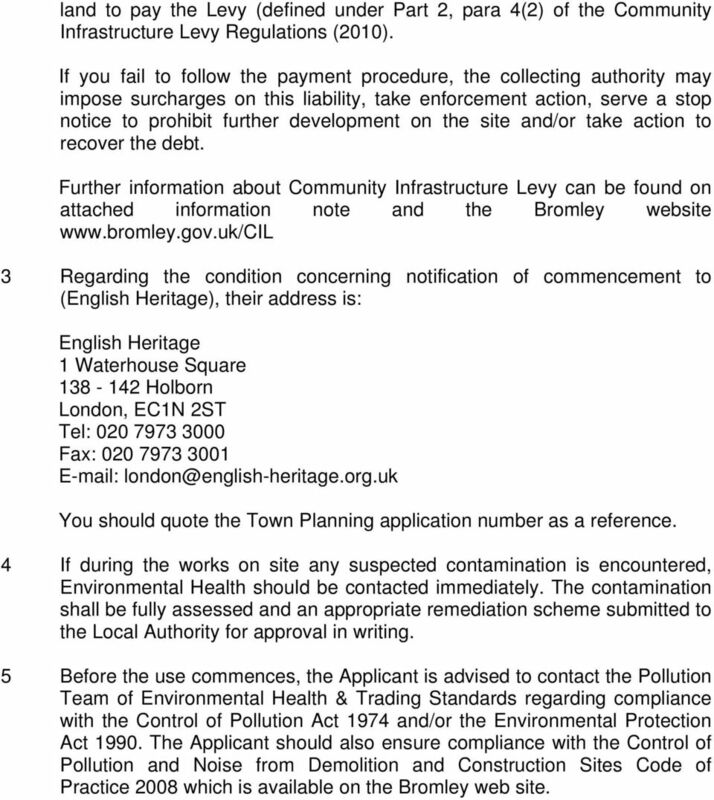 Further information about Community Infrastructure Levy can be found on attached information note and the Bromley website 3 Regarding the condition concerning notification of commencement to (English Heritage), their address is: English Heritage 1 Waterhouse Square Holborn London, EC1N 2ST Tel: Fax: You should quote the Town Planning application number as a reference. 4 If during the works on site any suspected contamination is encountered, Environmental Health should be contacted immediately. The contamination shall be fully assessed and an appropriate remediation scheme submitted to the Local Authority for approval in writing. 5 Before the use commences, the Applicant is advised to contact the Pollution Team of Environmental Health & Trading Standards regarding compliance with the Control of Pollution Act 1974 and/or the Environmental Protection Act The Applicant should also ensure compliance with the Control of Pollution and Noise from Demolition and Construction Sites Code of Practice 2008 which is available on the Bromley web site. HOW TO FILL IN THE FORM. Guidance Notes. Section 5. Colour and type of materials. Section 6. Property Ownership Certificate. Section 1. APPLICATION NO: LOCATION: PROPOSAL: WARD: PARISH: CASE OFFICER: AGENT(S) / APPLICANT(S): DEVELOPMENT PLAN ALLOCATION: 13/00397/HBCOUT Land at Widnes Recreation Ground, Liverpool Road, Widnes, Cheshire. 1 Welcome. The exhibition comprises a series of boards which provide some background information to show you our initial ideas for the site. Design & Access Statement : Proposed Internal Devlopment & External Plant to Data Centre Facility, 35 Imperial Way, Croydon. SANDRIDGE. Application in the FBURA. Welcome Welcome to the public exhibition for development at Bowman Field. This exhibition provides an overview of the proposals for the site. 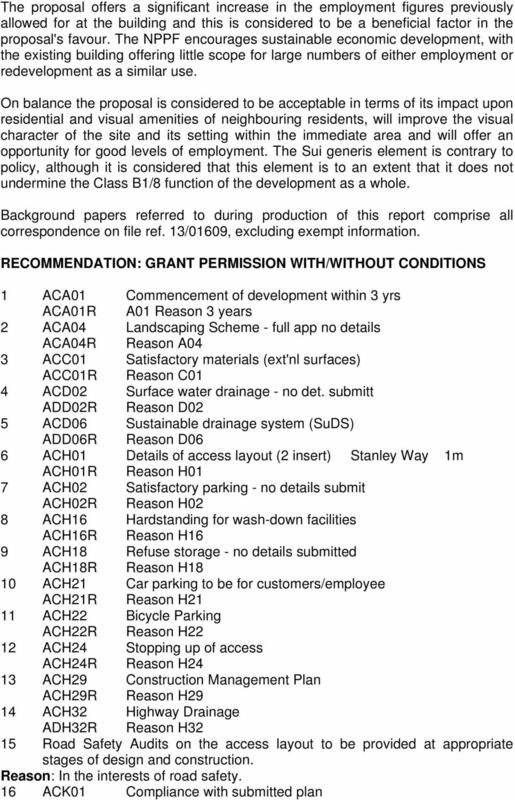 Community Infrastructure Levy in Croydon A guide February 2014 1 Contents 1. Introduction to the Community Infrastructure Levy... 2 2. Who will have to pay the CIL... 2 3. How much is the CIL?... 3 4.